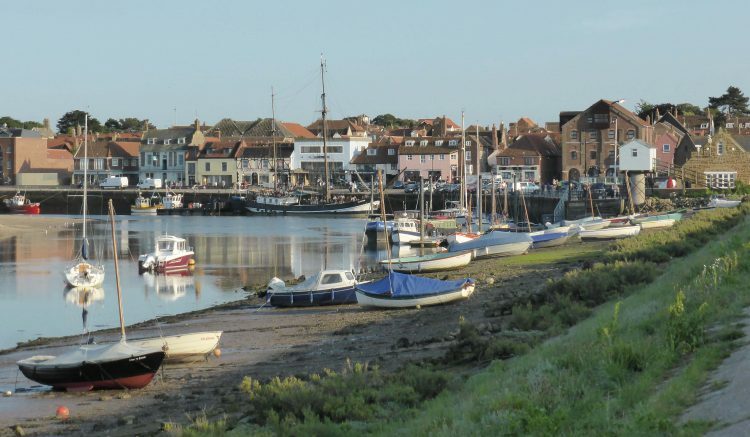 Before we set off on our travels a friend advised us to visit Wells-next-the-Sea whilst in Norfolk. The sun is shining today so we think a trip to the sea is called for. An interesting drive along the coastal road and we arrive at Wells’ busy harbour. You may have gathered I am not over keen on crowds of people, okay at a football match but I prefer visiting places when there are relatively few folk about. We park up and walk away from the town following Market Lane a broad track that climbs gradually towards Gallows Hill, at the end we turn right along an avenue of trees towards Golden Gates. 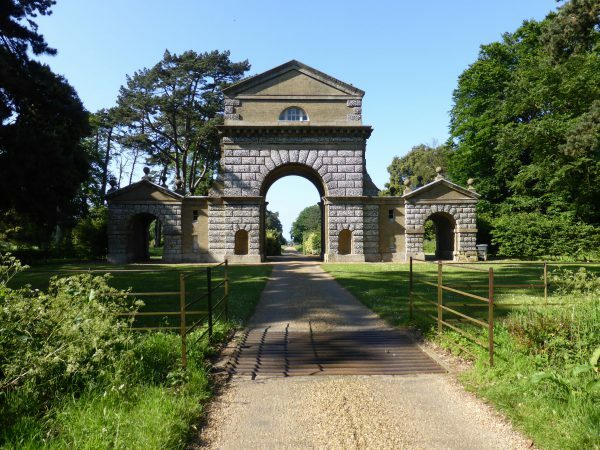 These are gates to Holkham Park, but there is no public access here. So we turn left and immediately fork right to walk alongside the estate wall. This is a long straight road, and I do mean a long straight road, it is almost two miles in length and very few cars pass by. The wall is made up of brick with flint infills, about a mile along we stop to calculate the number of flints in each infill (we really know how to enjoy ourselves when we are let off the leash!). We cannot agree, I think it is near 800 whereas Lyn suggests 700’ish, we settle on 750. There are three infills to every brick pier and the piers are fifteen yards apart. At this point I start to feel that anxiety that was a frequent aspect of maths lessons when I was at school. So the exam question is how many flints in the wall. I would suggest that it is the best part of loads and loads, but no doubt one of my followers might calculate it for me. That’s if I still have any followers. Eventually we reach a crossroads and turn right, still more wall so more flints! 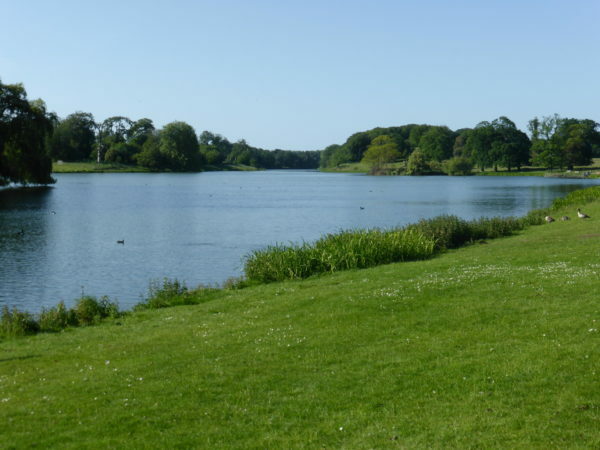 We then pass New Holkham an attractive crescent of homes, no doubt part of the estate. A short distance on and suddenly the view changes. To our left is the Triumphal Arch and to our right through the gates of the park, in the distance an obelisk. We turn left to the Triumphal Arch. This was completed in 1752, having been designed by William Kent in 1739. 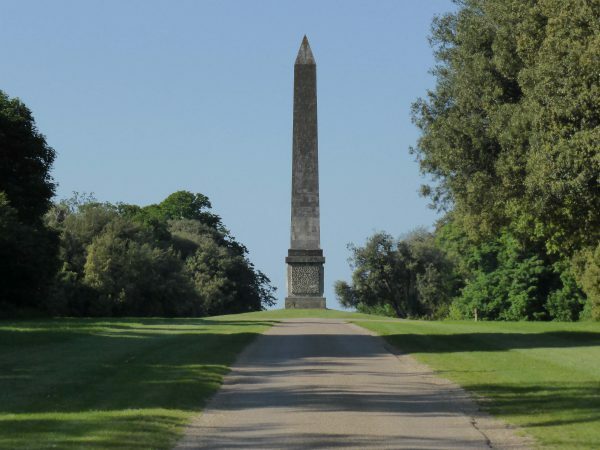 Photographs taken we return to the gates of Holkham Hall and walk along a mile long avenue of trees to the obelisk that has dominated our view for the last twenty -five minutes. Again designed by Kent and built in 1730. This was several years before the house was constructed. 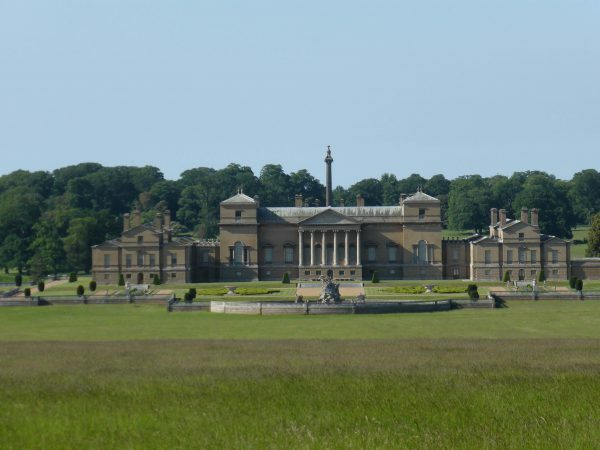 On reaching the Obelisk we get our first glimpse of Holkham Hall, it is stunning. It was built for the first Earl of Leicester, Thomas Coke. Unfortunately for him (and his estate tenants, as you will find out) he died in 1759, six years before completion of his grand home. At least the Earl got to enjoy his obelisk and triumphal arch! We enter the deer park and walk by the lake (a stop for Lynnie to take pictures of ducks! ), by the cricket ground where a game has just ended and out through large herds of deer. 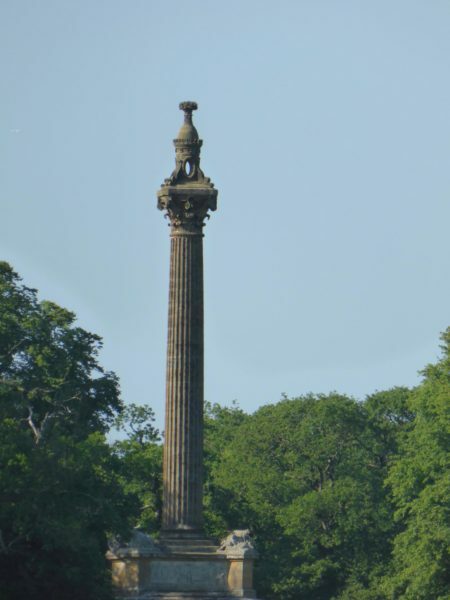 As we have walked we have viewed through the trees a monument high on a column. It transpires that this is the Coke Monument, erected on the Earl’s death at a cost, to the tenants of the estate, of £4,000. Now that is unfortunate! Passing through the gates we enter Holkham Village, an attractive collection of cottages and clearly a tourist attraction, as there are a number of people about. We press on across the road and down towards the beach. 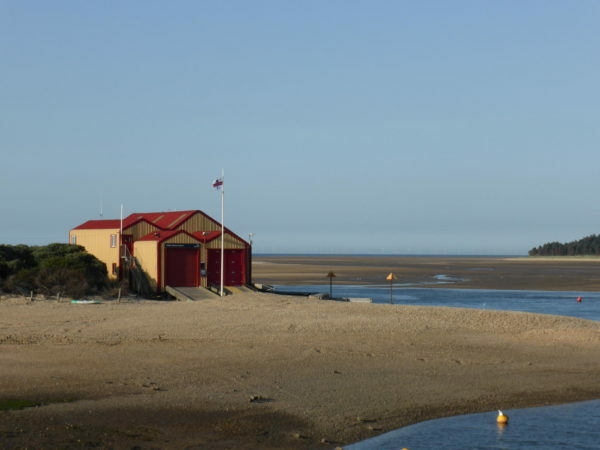 Here we have an option to follow a wooded path slightly inland or go through Holkham Gap and onto the beach. We choose the latter. The beach is huge. We have been on many with large expanses of sand but this has to be the biggest to date. 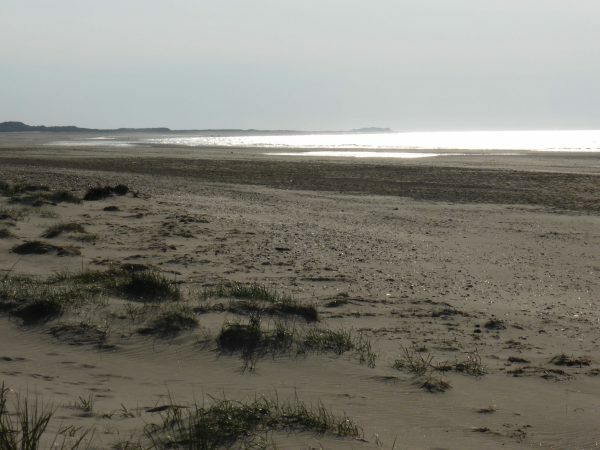 Unsurprisingly the beach, surrounding dunes and pinewoods have featured in a number of films and TV shows, including the 1976 film The Eagle has Landed and the final scenes of Shakespeare in Love. Apparently naturists use sections of the beach and dunes. You would need to be a hardy chap to get your kit off in this strong breeze. It is unlikely to do anything to enhance a bloke’s reputation. After about a mile on the beach we take a path into the pinewoods and follow this through to the Lifeboat Station. 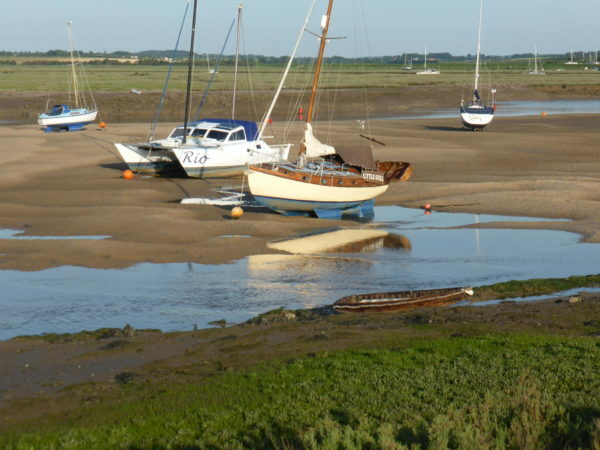 The views across the estuary and back to the harbour at Wells are stunning. The tide is out – everywhere we have been the tide has been out. 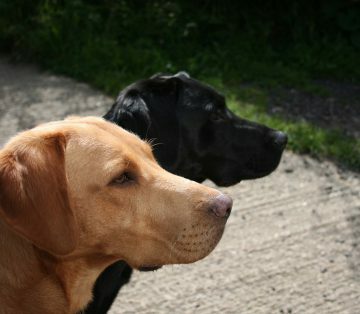 We walk along the bank into Wells, with frequent photograph stops. There are less people in Wells now than when we arrived. Many of those milling around are sat on the wall eating fish and chips. Lyn and I share a portion of chips (to be more accurate Lyn, Dexter, Crosby and I). 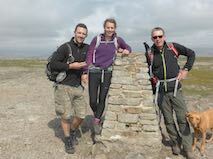 We have covered thirteen miles, not as short a walk as anticipated but for the most part very interesting. Copyright © 2019 Two Dogs and an Awning. Theme Version Two Dogs v1.0. Powered by WordPress.